When you are camping, try to cook food inside food on the campfire, wrap in foil and cook using the hot coals. It's a unique and tasty way to cook over the campfire. When you cook a food inside of another food, the outside food protects the inside food against the heat. At the same time its adding more delicious flavor. Food cooked inside of an orange peel makes a delightful and unique meal. Just place your food inside an empty orange peel and cook over the coals. The orange gives it a flavor you will relish. 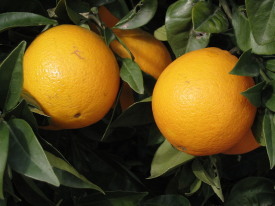 Choose an orange that has a thick skin. It makes it the inside fruit easier to remove. Cut the orange in half and push your fingers between the orange meat and the skin. You can also use a spoon to help remove the fruit. Some foods that are delicious when cooked in an orange shell are eggs, muffins, and cakes. Use your own ingenuity to think up other foods that would work well with this method. For cakes or muffins, you only fill the shell two-thirds full with batter. Place on a piece of foil and wrap, pulling the foil closed at the top. Be sure to leave room at the top for the cake to rise. Set on hot coals for 10 min. or until food is done. Some foods that are enhanced by the onion flavor (hamburger, etc.) are delicious and easy to cook using this method. To prepare, take a large onion and peel off the crisp outer layer. Cut off the root area. Cut the onion in half and pop out the centers. The centers can be saved for cooking use later. Place the food to be cooked inside the onion halves. Wrap each half in foil and place on a hot bed of coals to cook. The cooking time varies depending on what you are cooking. For example, an egg placed in an onion half and wrapped in foil will take 15 min. to cook. Hamburger will take 15 min. on each side. You can make a delicious treat from a banana, marshmallows, and chocolate. Cut a wedge-shaped section out of the length of a banana. Stuff some marshmallows, chocolate chips or other ingredients into the banana. Then cover the banana with foil, then heat over coals for 4 to 6 minutes. For more flavorful variations, you can also put in pineapple, maraschino cherries and nuts.